escapade: n. a piece of daring or reckless behaviour. How many times have you been labelled as mad or reckless because you homeschool? Well I say its time to break down those notions - Bring on the Madness ! 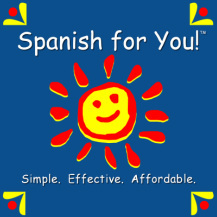 We were given the chance to review Spanish for You, it was designed by Debbie Annett who has years of experience as a Spanish teacher and it shows! this is a user friendly and effective Spanish curriculum. We chose Estaciones which is based on the topic of seasons, it consists of 27 weeks worth of lessons. We received the downloadable version which comes with a pdf of the book, lesson plans, worksheets, flashcard pictures and two MP3 audio files (one is a native Spanish speaker's voice). I did print everything out and bind it before we started so I could see how the different grade levels would work for us. One of the girls favourite activities was to created their own flashcards for playing games like memory, draw and fish. I also like how you use the book for all ages and just choose the lesson plans/ worksheets that would be appropriate for each individual child's level - It's perfect because we can study together but still work at individual levels so no-one gets bored. You can purchase the full package for $64.95 which contains the materials for all grade levels (3-8) or you can opt to buy grade specific packages for $39.95 for each individual grade level. Why don't you try some of their free lessons here to see how it would work for you, it's also worth checking out their free worksheets page and the games/activities page. We homeschool not because we are reckless but because we want our children to grow up with a love of learning combined with the knowledge that they can achieve anything they set their minds to. A LDS christian, wife, mother to four and one of 'those homeschoolers'. Here I hope to show you what we do, how we do it and why its a benefit to our children. Our little peacemaker, an angelic soul who loves maths and creating. Our cheeky soul - she loves to laugh, play and build.